Your business has champions, those people that enthusiastically support and endorse your products and services. Your business needs to be connected to these champions so that they can refer their friends to you. To invite someone to connect to your business as one of your champions, just ask them to select 'Connections' and 'New' and then enter your name and email address. They are now connected to you and can start sending you referrals. Alternatively, email your unique invitation URL, displayed in your member's portal, to your champions so that they can use it to connect to you automatically. To make a referral, just tap the 'Refer' tab, select the friend you are referring, the business you are referring them to and, optionally, a referral message. For example, if my friend Jim has a leaky tap and I want to send him to my plumber Fred, I would refer Jim to Fred and perhaps add the message 'Jim needs a tap fixing'. Within the app, you'll also reward your champions for making referrals. The member's portal is where you update your profile details and your story describing yourself or your business. Your story and your details will be sent automatically to the friends that your champions refer to you. Rewards are a simple way to thank those people who send you referrals. You can choose the most appropriate way to reward your champions. Whenever someone is referred to you, you'll get both an email and an app notification. You can also view all your referrals in the members portal. It is here that you can recharge your referrals account. 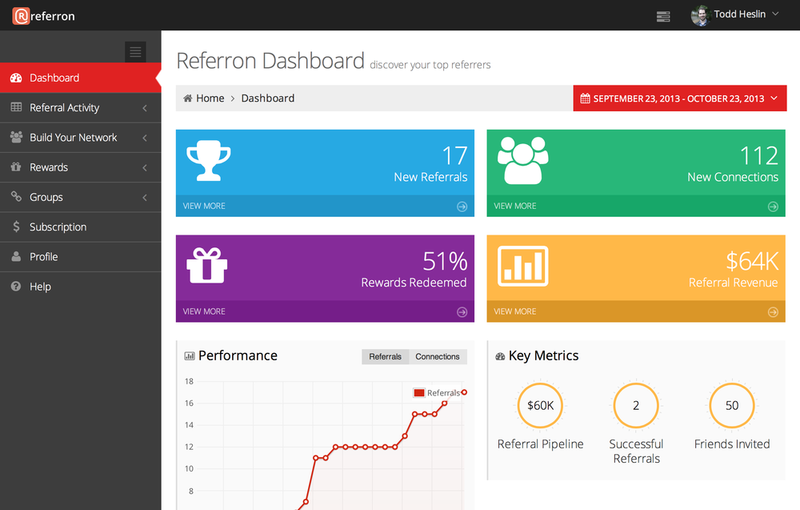 Various analytics are available including the Referron dashboard showing both referrals and connections. These can be exported for further analysis.